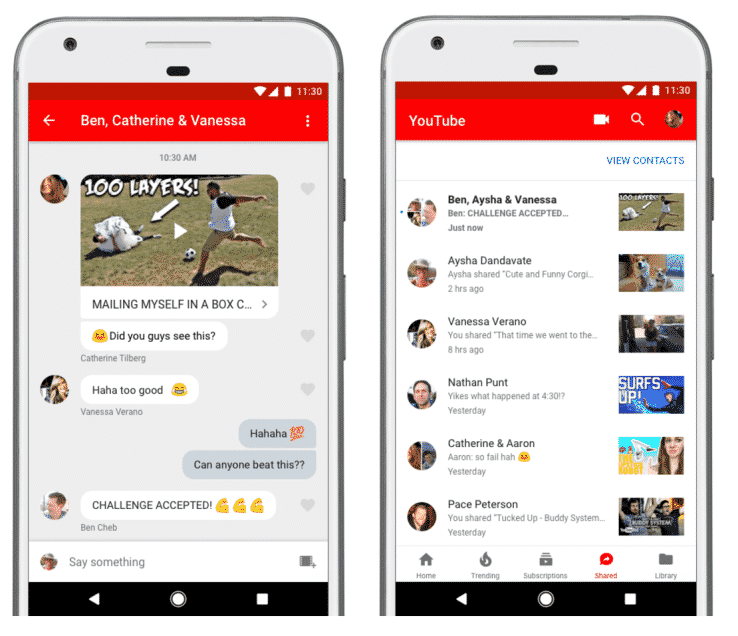 YouTube is rolling out an all-new in-app messaging and video sharing service via its most recent update. Released just yesterday for both Android and iOS, the feature was in being tested select markets. However, it has now made its way to mobile app users worldwide, meaning that you can share videos you love with your friends without having to copy/paste the link to share via some other messaging or sharing app. This new feature has turned YouTube into a messaging app, wherein you can send videos to your contacts and chat with them in a new tab in the mobile app. This new way to share videos was in beta phase since the middle of 2016 and was later launched in Canada, and then in Latin America. Following the positive feedback from the users, YouTube has decided it’s time for a global launch. The new feature is already being rolled out, so it might take some time before you see it becoming available here in Pakistan. YouTube has told the users via its blog that the user interface differs slightly from the one which was introduced in the testing phase. It has a more real-time feeling, meaning that you can chat while watching a video and the video sticks to the top while scrolling down in the chat. It hasn’t yet introduced co-viewing – like the one in its beta app for watching videos with friends – and emoji responses. The basic reason behind this new feature is to save time by allowing video sharing with friends within the mobile app, considering the fact that there’s a lot of social activity going on around videos. However, YouTube faces a stern challenge against the established social media messaging apps, which have strong user bases, while YouTube has to start it from scratch. The feature is easy-to-use and you can add friends from your phone’s address book, however, a downside is that any stranger can send you a request. You have the option to decline the request but it gets a little annoying when you receive a slew of incoming requests (true for a celebrity or a public figure). Group sharing is also allowed for up to 30 people and you have the option to reply to videos with other videos or a heart. So share the link, what’s wrong?